Have you ever wondered about all of the toxic chemicals you may be in contact with at work? Somewhere in you place of business, you can probably find an MSDS station. That is where all of the chemicals that you place of business uses should be documented. Have you ever read it? Do you even know where it is? 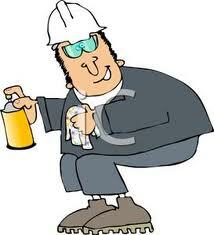 The problem with chemicals in the work place is that they are usually not effectively managed. Not only that, in most business places you have “third party vendors” that are also accessing your work space and many of them have chemicals of their own. Your interiorscaper is probably using some type of plant food or insecticide and your contracted cleaning people are using God knows what to clean your offices after everyone has gone home for the evening. Ever wonder what can happen when the chemicals they are using collide? You end up with a type of Sick Building Syndrome. Every chemical introduced into your environment leaves a residue. When those residues combine, the result can often be more toxic than the chemicals by themselves. That Orange Stuff® in the industrial and institutional setting. D-limonene will usually clean graffiti (including effectively replacing xylene in graffiti removers) off concrete because of its ability to remove paint. Strong enamels and epoxy paints will not usually be removed. State highway departments use d-limonene to remove asphalt and tar from cement bridges. D-limonene is not effective in other applications more suited for tile cleaners, toilet bowl cleaners, or areas where metal stains and mildew removal are necessary. D-limonene is not effective to clean concrete from trucks (a job more suited for acids). D-limonene can be used at various levels for a release agent that is sprayed on the beds of asphalt trucks before picking up their loads to facilitate easy unloading. In the release agent application, d-limonene may be a good replacement for diesel fuels commonly used in this application that are less suited to be dumped on the ground. Since d-limonene will not readily freeze (-142º F freezing point), the product lends itself to underground storage through cold winters. D-limonene concentrates (e.g. 85% d-limonene and 15% emulsifier) work well in closed automatic parts wash machines. The machines will dilute the concentrate automatically according to the quantity of water used in the wash cycle. Water-based concentrates do not work as well in this application because of a tendency to generate too much foam. Formulas should contain low foam or no foam surfactants (d-limonene by itself depresses foam). An important caution - hot soak tanks in areas of inadequate ventilation may cause workers to become nauseated by vapors and cause flashpoint concerns with concentrated fumes. Effluent from washer systems usually goes to holding tanks where local regulators can decide what can go down the drain and what should be hauled away for proper disposal. D-limonene is a great solvent to directly replace the toxic solvent components in existing solvent blends. One example is the 1:1 substitution of d-limonene in the place of xylene or 111 tri-chlor in blends with other inexpensive solvents to make up the balance (mineral spirits, isopropyl alcohol, butyl cellosolve, etc). So long as no water is present, re-formulating may not be necessary in a strictly solvent-based system. Aqueous systems incorporating d-limonene, surfactants, and water are especially popular for economic and environmental benefits. Levels of 3%-7% d-limonene with surfactants (nonylphenols like NP9, ethoxylated amines) are common for all-purpose cleaners. Generally these formulas take a 2:1 ratio to emulsify d-limonene at these levels (e.g. 10% d-limonene, 5% surfactants, balance water). The addition of EDTA (chelates) to tie up metals, and phosphates (builders) such as STPP, TKPP, and metasilicates will contribute to the balance of the emulsion and probably significantly improve the overall effectiveness of cleaner. These various ingredients can be adjusted to raise the PH to the desired level and improve chances of creating a stable "non-separating" formula. The 3%-7% d-limonene level is effective on heavy grease, oil, carbon and road film. It is an excellent whitewall tire cleaner in the concentrate form. The trick to successful spot and stain removal is to first evaluate the type of stain and then select the correct cleaning agent. D-limonene concentrates (85% d-limonene, 15% emulsifier) can effectively remove ink, oil, grease, paint, tar, bubble gum, and asphalt. Bloodstains, on the other hand, may require enzyme products. Rust, coffee and tea stains probably require low concentrations of mild acids (citric or phosphoric acid at 3-5%). D-limonene is very effective removing almost any soil including ink, paint, grease, and tar. Solvent-based hand cleaners usually contain approximately 30% solvent. At 10%, d-limonene will out-perform most other solvent hand cleaners. Also 10% level keeps cost competitive with traditional solvent-based systems. Generally, formulas require an equal percentage of surfactants to produce stable gel or lotion products. The addition of low levels of lanolin, jojoba oil, glycerin, or petrolatum reduces skin irritation associated with prolonged skin contact with d-limonene. Many types of grit (gentle abrasives) besides pumice are sometimes added to heavy-duty d-limonene hand cleaners, including polyethylene beads and corn-cob grit.